and structures as a safety precaution. Solar Lane Marker is one kind of road studs used to illuminate the road and Indicate the direction at night or during the rainy or foggy weather.It is solar powered, easy to install, with an unbreakable pc shell and aluminum bosy, a solar panel,6 leds and control components . 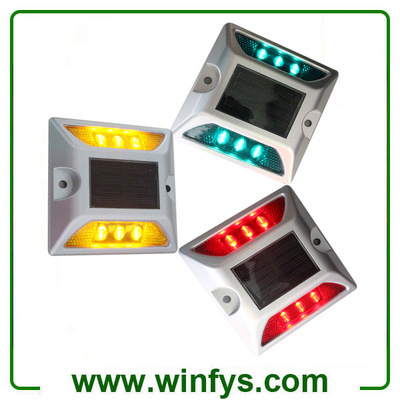 The self-illuminating and active reflective lane marker can make its active light-emitting and light reflection, usually used in conjunction with the road marking sketching the outline of the road to improve road visibility and safety.